Nicky has always known Russell was rich, but he has no idea how astronomically rich Russell is until his friend drops dead, on his 50th birthday, in his San Francisco mansion, with Nicky as the only witness. For forty years the two men have kept up their friendship, with Russell's birthday offering him an annual opportunity to remind Nicky of how much more successful Russell is, and how much further he has come since their English suburban childhood. And now Nicky has come up with an uncharacteristically daring plan. If Nicky were to become Russell and leave his old life lying dead on the bathroom floor, then he, his wife Sarah and their daughter Scarlett could start again. Only with better clothes, better hair, better stuff and a better future: everything that money can buy. Especially happiness. Sharp, funny, warm and acutely observed, Wake Up Happy Every Day is a novel about dreams and delusions, family and friendship, and what happens if you do actually find the pot of gold at the end of the rainbow. 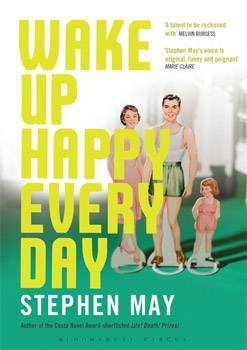 Stephen May 's first novel Tag was published by a small Welsh press and won the Reader's Choice Award at the 2009 Welsh Book of the Year. His second, Life! Death! Prizes!, was published by Bloomsbury in 2012 and was shortlisted for the 2012 Costa Novel Award and the Guardian's -Not the Booker Prize'. Originally from Bedford, he now lives and works in West Yorkshire.